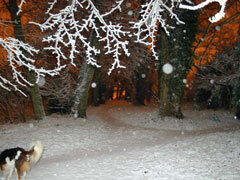 A winter woodland in Henley on an early February morning after heavy overnight snowfall. 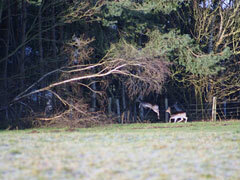 Deers jumping over a wire fence in countryside on The Mount (or Roundhead Hill) near Henley. 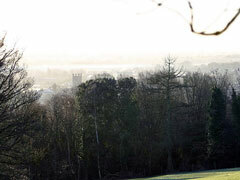 The tower of Saint Mary's Church just peaks through the mist in this view taken from a hill side close to Henley. 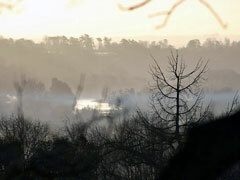 A misty River Thames taken from countryside hills near Henley one winter morning. 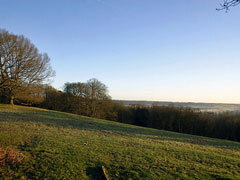 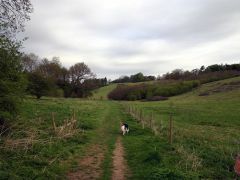 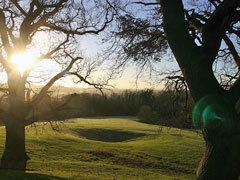 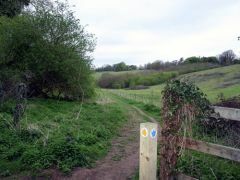 Beautiful Chiltern views like this can be found just a stones throw from Henley. 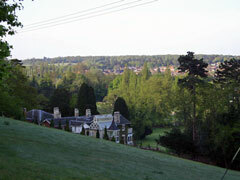 A view looking down over Hambleden valley from The Mount in countryside close to Henley. 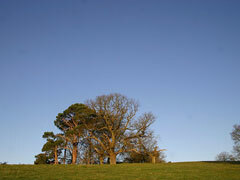 A small copse of trees at the top of "Roundhead Hill" in countryside near Henley. 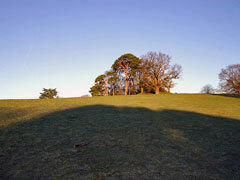 Looking up "The Mount" near Henley towards a small copse of trees. 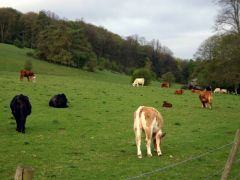 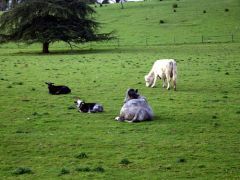 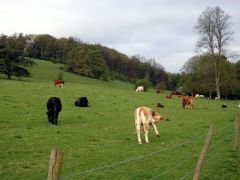 Cows (most of whom are choosing to face away from the camera) in a field by Hernes Farm. 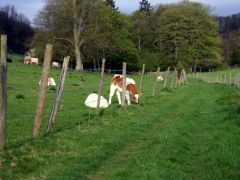 A calf eating grass through a barbed wire fence near Hernes Farm. 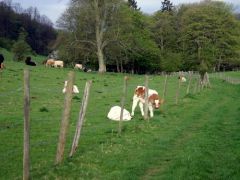 A calf poses for the camera through a barbed wire fence near Hernes Farm. 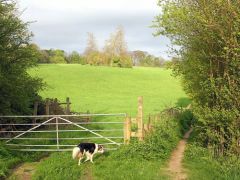 Dog waits patiently for owner to catch up on a lovely morning walk along "Happy Valley". 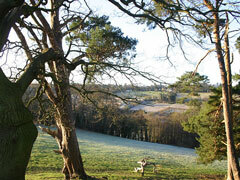 Looking towards Hernes Farm; this area is also known by the names Happy Valley and 44 Acres. 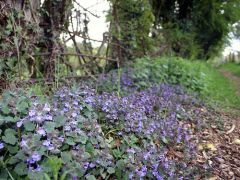 Ground Ivy growing alongside the footpath by The Henley College playing fields. 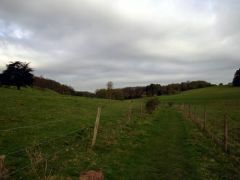 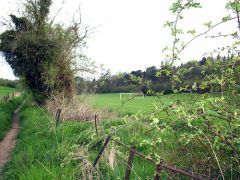 A footpath that runs parallel to playing fields owned by The Henley College. 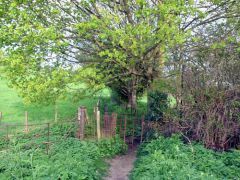 An old rusty kissing gate that provides access to a footpath running alongside playing fields belonging to The Henley College. 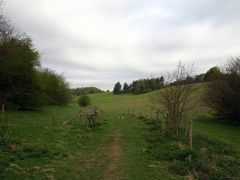 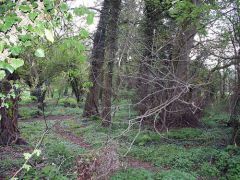 View from a farm gate and stile looking towards a small copse of trees perched on top of a green hill.